Every time I have offered blocks to my students to play, i am amused at what gets built. 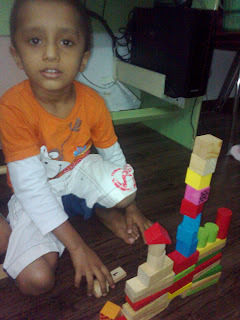 Our Mumbai kids have visioned super constructions on their mind...let me put down a super-duper list. this is my house and in the next tower is my father's office, when pa comes home for lunch, i will go to work in the office. this is my house and i can slide down from here to my friends house. this is my house and this is my mothers house and this is my fathers house.....ahaha ...i wonder what's gettting constructed here...hee hee " :-& "
this is my tower and next to it is "Inorbit Shopping Mall" and inside the mall tower is my School.... ":-0"
there are many more to this forever growing list :-))) but mind u, i don't see gardens or temple /church showing up in their planned cities...how worthwhile it is to celebrate this vision, i often wonder in pain.